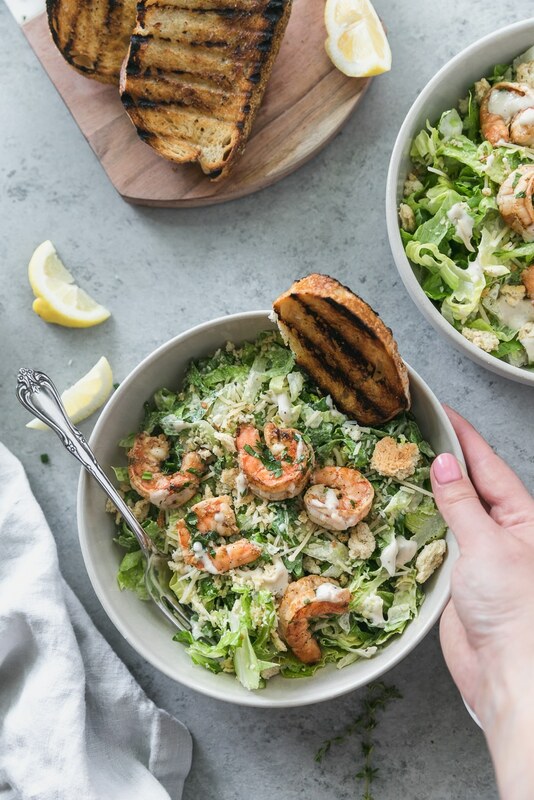 This Lemon Herb Shrimp Caesar Salad with Grilled Garlic Bread is a super simple, flavorful, and satisfying summer salad that takes just minutes to make! 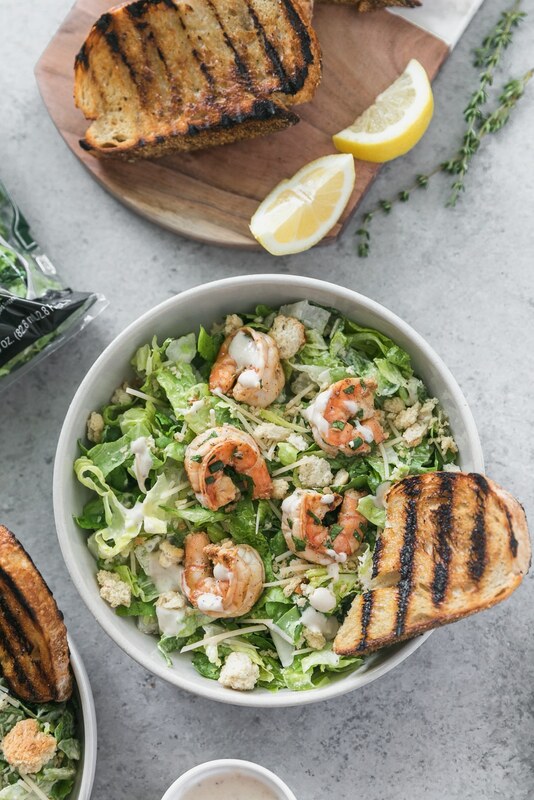 We’ve got marinated lemon garlic shrimp tossed in fresh herbs, parmesan cheese, crushed croutons, creamy Caesar dressing, and crusty grilled garlic bread. Sign me up! If you don’t know by now, I LOVE a good salad. I eat at least one huge salad a day, and often it’s two. 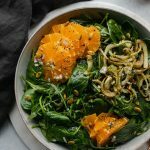 I’m such a big texture person, and I love creating salads with lots of flavor, color, texture, and just all-around delicious things. 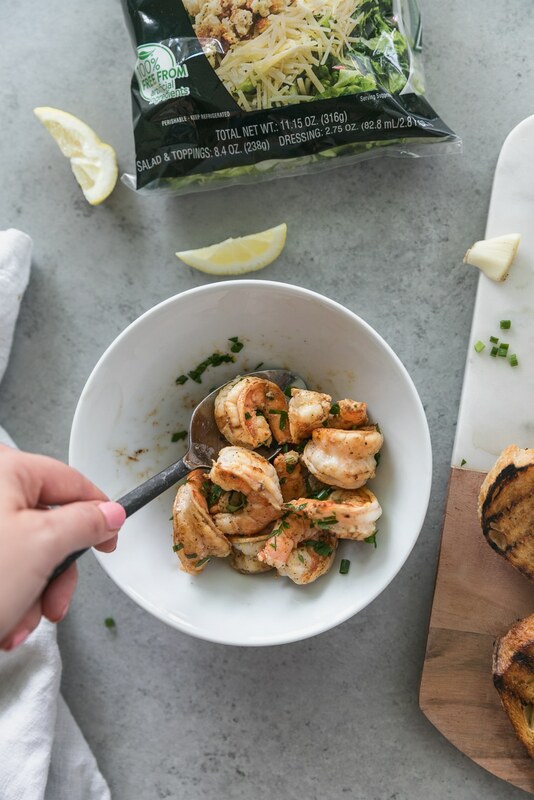 This is one of my ideal combinations because 1), lemony garlicky shrimp. And 2), GRILLED GARLIC BREAD. 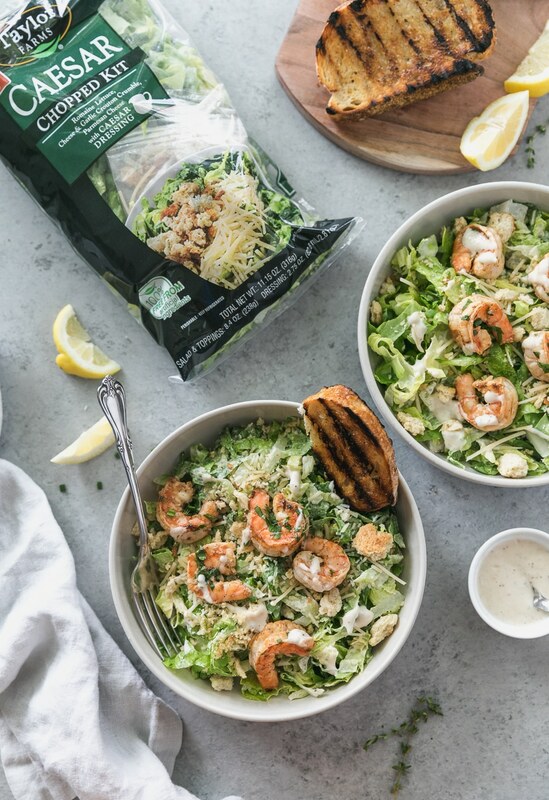 The garlic bread is pretty much the most delicious thing ever and it’s the best compliment to Taylor Farms new Caesar Chopped Salad Kit! These kits are so much fun, and such a simple way to get dinner on the table or make a quick lunch that’s healthy and super delicious. 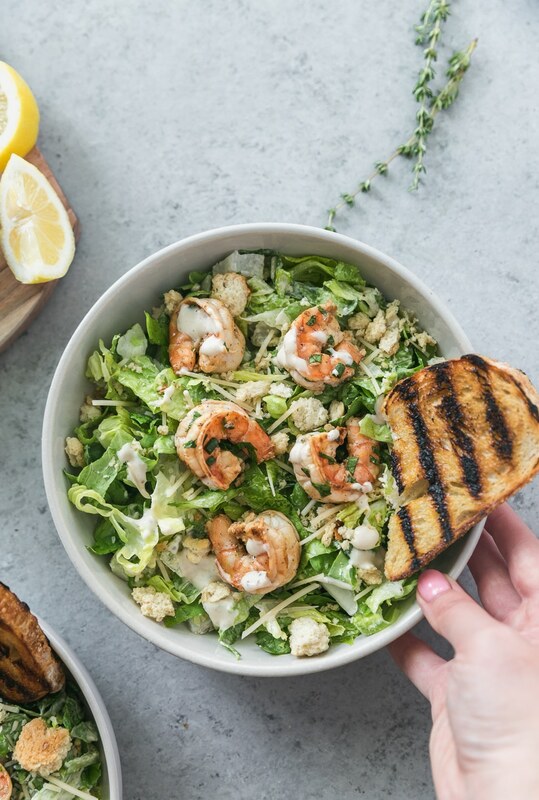 All of the additions in the kit make this Caesar even better: cheese and garlic crouton crumble (yes please), parmesan cheese (always), and the creamiest Caesar dressing! 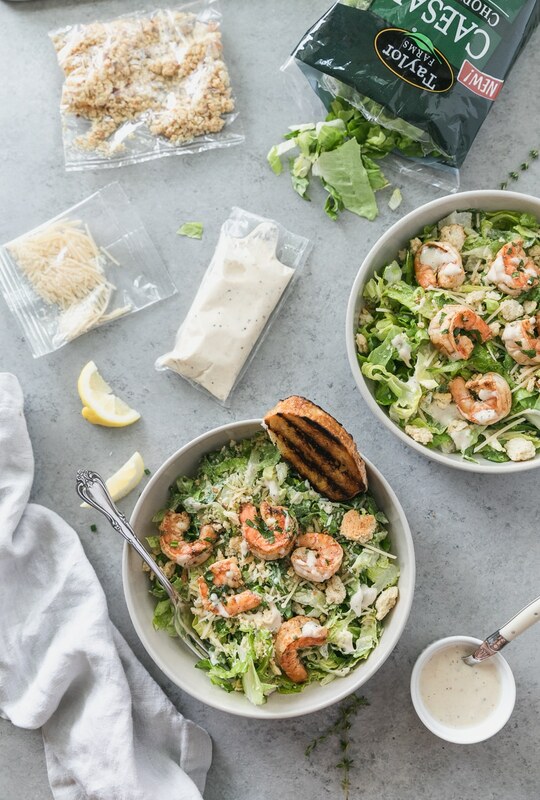 I also love how the romaine is finely chopped, because everything mixes together and you get a little bit of goodness in each bite! When I thought about what I wanted to add to this kit, I thought BREAD. Well, I always think about bread, but especially with cheesy things and creamy dressings that you just want to soak up! 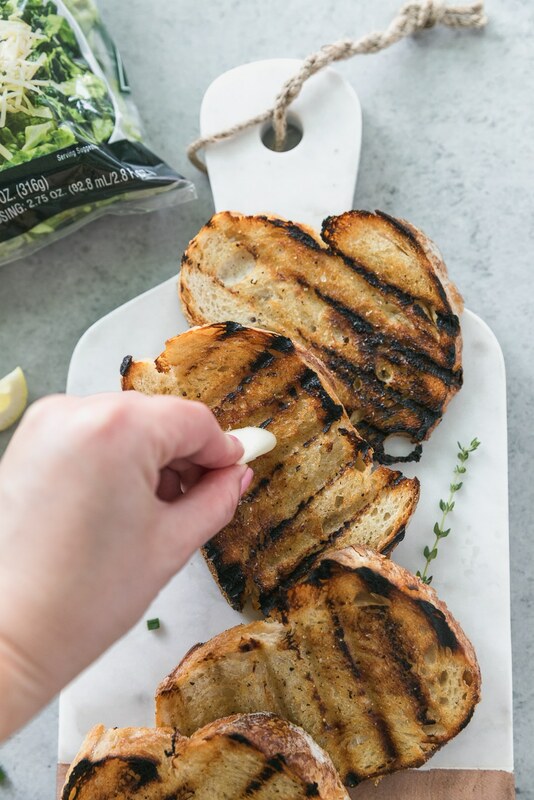 In the summer I’m all about using the grill for just about anything and everything, and bread is definitely high up on my list. You literally just brush some really good quality, crusty bread with olive oil, season it with a little salt and pepper, grill it for a minute or two per side, and rub it with a fresh garlic clove while the bread is still hot. It’s DREAMY. As in, I could eat an entire loaf in no time. In addition to the grilled garlic bread, I wanted to add some kind of protein, and I went with shrimp! Sometimes I eat so much chicken and I get really sick of it – I think most of us can relate. But something I never ever get sick of is seafood! I would gladly survive off of salmon, shrimp, and scallops if I could. These shrimp are so easy to make, and they’re filled with bright citrus flavor and fresh herbs! 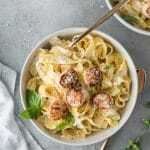 I used a mixture of fresh thyme, chives, and parsley, but you can use whatever you have on hand! Any fresh herbs will be amazing in this. I don’t really discriminate when it comes to fresh herbs, I love them all so much! And they make any simple meal so incredible. I’m a huge believer in using really fresh produce, lots of fresh herbs, and citrus in cooking, because it’s healthier and will make you feel great, but also tastes amazing. Also loving how this salad has two layers of bready/cheesy things. Cheesy crouton crumble, shredded parmesan, AND grilled garlic bread. I mean could it get any better?! And the best part is, the kit comes with everything you need, and the shrimp and garlic bread are super simple add-ons. The whole meal took me absolutely no time to make. Such a perfect summer dinner! 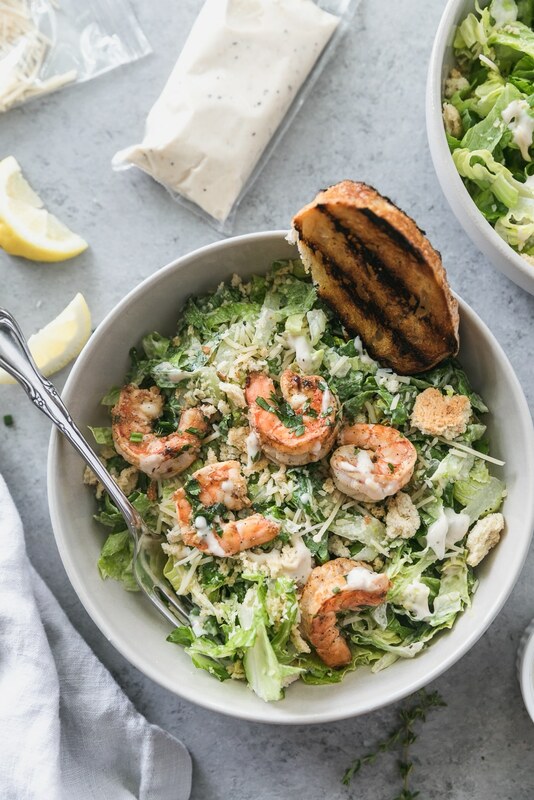 This Lemon Herb Shrimp Caesar Salad with Grilled Garlic Bread is a super simple, flavorful, and satisfying summer salad that takes just minutes to make! 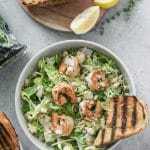 We've got marinated lemon garlic shrimp tossed in fresh herbs, parmesan cheese, crushed croutons, creamy Caesar dressing, and crusty grilled garlic bread. Sign me up! In a medium bowl, combine the shrimp, lemon zest, lemon juice, garlic, salt, and pepper. Stir to combine and let marinate for 15 minutes. Heat a medium nonstick skillet over medium-high heat and add the shrimp. Sauté for 2 minutes or so per side or until cooked through. Finish with an extra squeeze of lemon and stir in the fresh herbs. 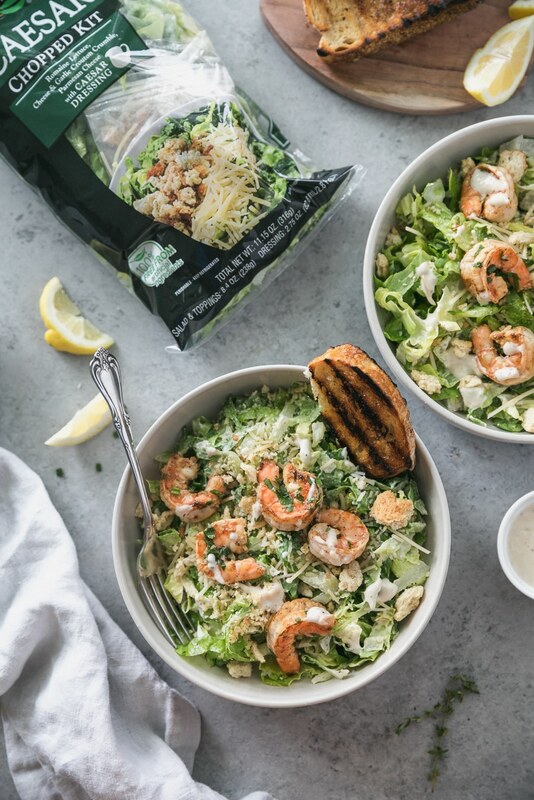 To assemble the salad, place the chopped romaine in a large bowl, and add the cheesy crouton crumble, parmesan cheese, and dressing and toss to combine. 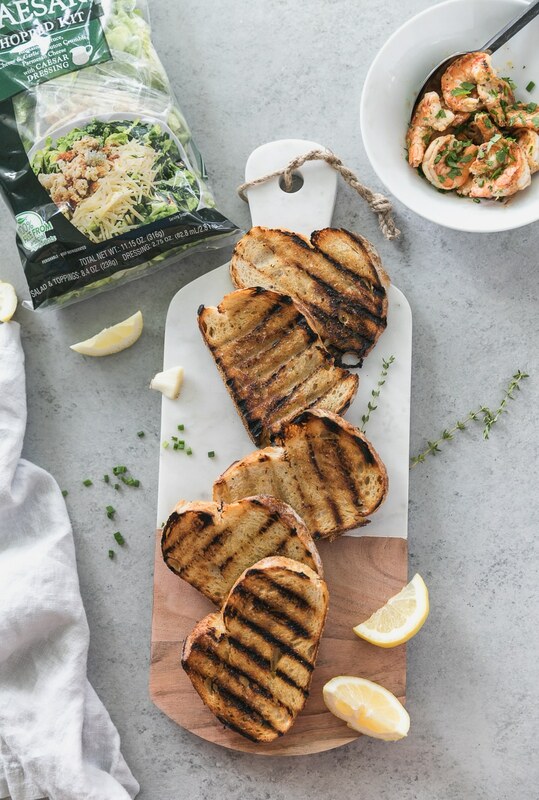 Top with shrimp and serve with grilled garlic bread. Enjoy! Preheat a grill pan or outdoor grill to medium-high heat. Lightly brush both sides of the bread with olive oil. Season with a pinch of salt and pepper. Grill for 1-2 minutes per side, or until grill marks appear. While the bread is still hot, rub both sides with a garlic clove, "grating" it into the bread to infuse the flavor. Repeat with all slices of bread. « I’m writing a cookbook!